For a democratic secular Iran. For peace and prosperity in the Middle East. : With "Moderates" like this, who needs a "hardliner"?! With "Moderates" like this, who needs a "hardliner"?! The Western media headlines of "Moderates Swept to Victory in Iran Elections" was baffling to many who follow Iran news closely and have a better understanding of what is going on and who is who in Iran. Of course since the New York Times Interview with Ben Rhodes, now we know about his "echo chamber" lapdogs, the Laura Rozens and Barbara Slavins, and the "narratives" they were supposed to produce. And so the narrative for the recent Iran "elections" was supposed to be something along the lines of 'because of the nuclear deal, Iran's moderates have received a huge boost and it was a big set back for the hardliners! '..yeah right!! I have written before about this 'good cop/bad cop' game the Islamic Republic plays with its moderates v hardliners, much in tune with how the KGB used to play it in Romania under Ceausescu, and also how former murderers and paedophiles were re-branded as "moderates" in the last Iran election game. So just to hammer the point home a bit further, I thought I share with you this footage of Isfahan Friday Prayer leader, Ayatollah Tabatabaei-Nejad's sermon, made last Friday. 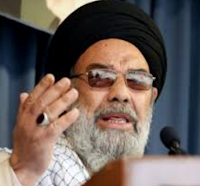 This very Ayatollah was one of the nominees for Iran's "reformist" list of candidates that the BBC Persian "Iran analysts" were recommending the people of Iran to vote for! His victory to represent Isfahan in the Assembly of Experts was hailed as a triumph for Iran's "reform" movement! Here is the footage below, followed by the translation of the sermon below. Judge for yourself, with "moderates" like this, who needs "hardliners"?! "They have brought me pictures yesterday that shows women by the side of this dry river [Zayandeh-rood], whose actions will ensure the upper stream of the river will become dry too. Believe me its true! You may ask yourself why do European countries with so much crime and sin have so much rainfall? Yes the Koran says we do not punish the unbelievers, and even if it didn't cause Muslims so much anxiety we would make their [kuffar] roofs made out of gold, God punishes the believer, God punishes the Isfahani, for remaining silent and letting girls and women take pictures by the river as if they were in European countries, you expect the representative of the Supreme Leader to do it all by himself? I tell you he won't. What our great Imam Khomeini once told us was 'what scares us is cultural dependence and not sanctions or military invasion' and so we shouldn't fear sanctions or military invasion but we should fear cultural invasion, it will destroy our revolution and the blood of our martyrs will go to waste, we must not make excuses like 'oh I told that woman but she stood up to me!" so what if she stood up to you? You stand up to her too! I am not saying beat her up, but do tell her! they tell me in some of these social media sites, they have formed groups who call themselves fast-breakers! they message each other and ask to see each other breaking their fasts by showing what they are eating for lunch! This is standing up to religion, these are hypocrites! Or another one has set up a group against Hejab and they ask each other to send their pictures with no hejab. they say they have 1500 members! I here by tell the Telecommunications company, if you can identify these people but are not after them, then you are traitors to Islam! These people who confront the fasting and confront the Hejab are hypocrites and hypocrites are worse than Kuffar! they should be arrested and not released soon! I asked and the communication company said they can find these people, well find them! shut them up! strangle them! we can't just sit still and say such things are taking place! and just kiss our teeth in disapproval!"